On May 2018 the Royal Research Ship (RRS) Discovery will begin an ambitious science expedition to the South Atlantic to study the role of low oxygen zones in ocean carbon storage. The results of this investigation will help improve understanding of how the ocean’s biology contributes to the long-term storage of carbon in the ocean. The National Oceanography Center (NOC) will lead this expedition to the Benguela upwelling region of the South Atlantic, where cold, nutrient-rich water rises to the surface, providing the food to fuel large blooms of tiny marine plants, called phytoplankton. The science conducted on this latest expedition forms part of the COMICS project, and is key to improving understanding of how the climate is affected by life in the ‘twilight’ zone. This is the part of the ocean between 100 and 1000 meters, where sunlight is barely detectable. Small creatures in the twilight zone catch and intercept material sinking from the sea surface, leading to the carbon in this material being stored in the ocean rather than in the atmosphere. It is currently known that the efficiency of carbon transport from the atmosphere through the twilight zone is key to regulating atmospheric CO2 levels. However, the processes that control the efficiency of biological storage of carbon in the deep ocean are not well known, which is an obstacle to predicting how they may be affected by climate change. NOC scientist, Dr Stephanie Henson, who will be leading this expedition, said “As the phytoplankton sinks through the twilight zone it strips the water of oxygen. This area of the South Atlantic is particularly interesting because we think this low oxygen environment could have an influence on the ability of the ocean to store carbon. For example, the animals that usually consume the organic material sinking through the twilight zone may not be able to survive in low oxygen conditions. Until last year it appeared that the animals living in the twilight zone required six times more carbon to survive and grow than was being supplied to them. However, a pioneering study published in Nature by NOC scientists was able to balance the ‘carbon budget’ in this zone and so explain this discrepancy. 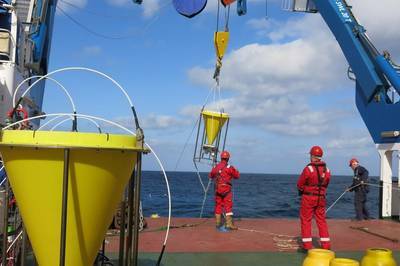 The NOC-developed sediment traps measure the volume of sediment that sinks in a given period of time. This sediment is often referred to as ‘marine snow’ because it falls gently down through the ocean. The sediment traps will be used in different regions during the COMICS project, allowing scientists to more accurately calculate the amount of carbon entering the global ocean system. The COMICS project will also compare the amount of carbon entering the system with the amount of carbon consumed by biological processes within the twilight zone by measuring the rate that animals, such as jellyfish and krill, breathe. Once COMICS has built an understanding of how the twilight zone works, the first model of carbon transport in the twilight zone based on direct ecological measurements will be developed. Previously, models have been based on indirect measurements of ecology, such as temperature, which cannot explain the observed efficiency of carbon transport alone. A simple mathematical model of the twilight zone will first be created and then applied in global climate models. The COMICS project is led by the NOC and is a collaboration between the British Antarctic Survey and the Universities of Queen Mary London, Liverpool, Oxford, Heriot-Watt and Southampton. 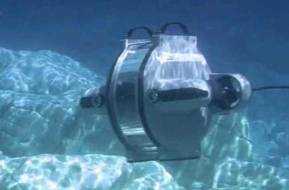 The project has received funding from the Natural Environmental Research Council (NERC).